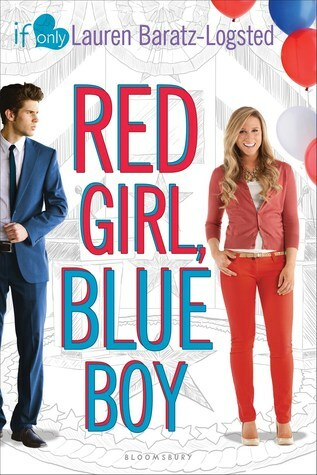 After reading the synopsis, I requested Red Girl, Blue Boy right away. I thought I was going to love it. I mean the son and daughter of rival presidential nominees? Yes, please! However, the book did not meet my expectations. The only life that Katie Willfield knows is one of politics. Her mother died when she young, and she grew up working on her politician father’s campaigns. There’s nothing she rather do than manage her father’s biggest campaign. However, she was pushed out of the business a few years ago due to the advice of the campaign manager saying she needed to live a normal teenage life. Now she has the chance to reenter the field…but only if she agrees to do a joint interview with the son of the Democratic nominee. The last thing Drew Reilly wants is to be in the spot light. He grew up in a poor neighborhood with his family until his father hit it big and made millions off an invention. Now his mother is running for President and he wants nothing to do with it. He’s perfectly fine taking the bus to the school in his old neighborhood. However, after Drew’s best friend tweets Drew’s unfavorable comments, Drew’s mom wants him to appear on The Morning Show with the Republican nominee’s daughter. Katie and Drew meet on set where they instantly don’t like each other. However, after the host asks Katie some embarrassing questions and Drew says her from them, Katie returns the favor by saving Drew from a mob of girls after the show. They decide to hang out for the rest of the day and as they say, the rest is history. They begin a secret relationship that they keep hidden from the public and their parents. The main reason that I didn’t enjoy the book was due to the characters. Katie’s personality was way over the top and very hard to believe. Both Katie and Drew acted a lot younger than sixteen, which made it hard to relate to. This was definitely written for a younger audience. There were some cute, fluffy parts in the story, but I would have enjoyed more banter between Katie and Drew in the beginning. I would have liked to see some political back and forth between the two, but alas, there was none. Also, the prologue part was unneeded and just added to unbelievability of the story. Overall, this story was set up to be a cute rom-com, but it was just too young for me.